PAWS needs citizens like yourself (witnesses) to be taking concrete steps in filing charges so that we can prevent this cruelty from happening again. In order to prosecute criminals for the violation of the Animal Welfare Act, PAWS (as a volunteer-based NGO) needs the complete details - date, time, exact location, people involved, affidavit. If you are not willing to execute an affidavit, please recommend another eyewitness who will. Without a willing witness and affidavit, PAWS cannot help file a case. If the persons committing the crime are not known, the best we can do is alert police officers to the exact location in the hope that they will be catching the criminals in the act. Kindly call National Emergency Hotline 911 immediately if you see a 'dog katay' in progress or anybody selling dog meat. Take down the name of the one receiving your call. All 911 operators treat reports seriously and can send a mobile patrol right away (but it would be good to take down the name in case you end up with an uncooperative call-taker). For advise on how to call 911, scroll down below. your witness affidavit - MOST IMPORTANT. What should be on your affidavit is your personal account (what you actually saw and/or heard) of the incident. It is just a narration of FACTS (important: what acts were done, where did it happen, when did it happen (date and time), what you did when the crime was committed, who committed the crime). The affidavit must be BRIEF, PRECISE and leaves no room for doubt (in terms of the guilt of the animal offender). Pictures/videos will be attached to the affidavit as supporting evidence only - your witness affidavit is the most important document needed. veterinary certificate - Ask this from the vet who treated your pet for the injuries sustained from the cruel incident. This will be attached to your affidavit as a supporting document. There is no need to have the affidavit notarized. CC: pawsphinquiries@gmail.com in order to submit a complete report. First off, has anyone tried to warn these people that what they are doing / planning to do is against the law? (Or is everyone just keeping quiet?) Ignorance of the law excuses no one but it would be a good start to send them warning. PAWS' warning letter sends a message to the pet owner/animal offender that what he/she is doing is wrong and against RA8485 The Animal Welfare Act and/or RA9482 The Anti Rabies Act. PAWS can send an official letter to them through the barangay (which is why we ask for the contact info and address of the barangay captain/officers.) Note: Your witness affidavit is needed even in this warning letter stage. In case offender challenges PAWS to file charges after receiving the warning letter, we must have your witness affidavit in order to push through with the case. Report the animal offender to the barangay so that the barangay will know to watch out for them. Furnish barangay officials with a copy of RA8485 (The Animal Welfare Act). Please note that PAWS gives free barangay lectures on animal welfare and they need only to contact us ahead of time and arrange for our transport. ---- If your barangay officials refuse to act during the time that you reported the crime to them, please execute an affidavit re: their names, what happened, etc. so that we can file administrative charges against them. --- If your barangay officials are the ones participating in the cruelty, execute an affidavit so charges can be filed against them. They are not exempt from following the law. Prepare your witness affidavit. There is no need to have it notarized. Email it to PAWS and our volunteer lawyer will review it for free. Once given the go signal by our volunteer lawyer, you may file it at your City Prosecutor's Office. Note: There are no expenses involved with filing a case except for your transportation to the City Prosecutor's Office. volunteer lawyers can help you review your affidavit. PAWS needs and encourages everyone to take action: report cases , provide your witness affidavit and file charges against cruelty. Verbally complaining (even through email) is not enough. Photos/videos are only supporting evidence, the witness affidavit is the most important document needed. We consider all reports and identities confidential. Informants have to entrust us with their names. PAWS will never pass on the names and contact info of informants or witnesses to the offenders. The name and contact info of the person reporting a case to us is needed to help coordinate investigations and to ensure there is a witness who can testify in court so that the offenders will be found guilty by the judge. The accused only learns of the identity of the witness when the case has been filed at the City Prosecutor's Office. This is because it is the right of the accused to know who has borne witness against him. Future reports with "anonymous", "secret" o "codename" senders will no longer be entertained because such informants don't help us file cases and bring perpetrators to justice. To neglect to provide adequate care, sustenance, shelter or maltreat any animal. To procure animals to be tortured. The killing of any animal for human consumption except cattle, pigs, goats, sheep, rabbits, carabaos, horses, deer & crocodiles is unlawful. (7) Any person found guilty of trading Dog meat shall be fined not less than Five Thousand Pesos (P5,000.00) per dog and subjected to imprisonment for one (1) to four (4) years. Great Tuesday to all! This is Nita Hontiveros-Lichauco (NHL). One of the fastest ways of helping rescue animals is by telephoning 117.even if you can't leave your house.AND PLEASE SOUND AUTHORITATIVE. PARC: Tata, we received a call reporting the killing of dogs for pulutan, in Caloocan. We and the reporter called 117 but were told they don't attend to animals. Here are the details: At a new construction on Almaciga street, Blk.4 Lot 7, Amparo village, Gate 2, North Caloocan, the owner is exchanging coco lumber for DOGS for pulutan. 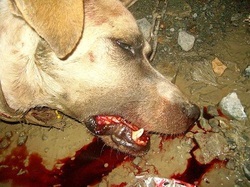 There are already 2 skinned dogs, there are some more still alive. NHL: Thanks, I'll phone 117 right now... Hello, 117? This is NHL, President of PAWS . My telephone is 724.1986. I am reporting a violation of our NATIONAL LAW, RA 8485 and of Metro Manila Ordinance 82-02 which prohibits killing dogs for pulutan. WHOM AM I SPEAKING TO, PLEASE? NHL: Thanks, Code 0166 . This is my Report. ( I give the details). Please contact the roving police car of that area. 117 : Hold the line, Ma'm, I'm contacting the TACTICAL OPERATIONS CENTER of Caloocan City. NHL: Please give me the TOC telephone... ( I dial given number 362.3276) Good morning, TOC, I have just phoned 117. ...Ah, thank you, they have contacted you already. May I please have the names and telephone/s of the Police Officers of Precinct 17 whom you have dispatched to Almaciga street? Thank you. ( I dial Precinct 17 at # 417.7829, Police Officers 1 , or PO1 MANOSA and MABALA . ) The lady agent who answers this number says PO1 Manosa and Mabala are on their way to Almaciga street. NHL: THANK YOU VERY MUCH, TOC, FOR YOUR ADMIRABLE ADHERENCE TO THE LAW. I'LL CALL AGAIN TO ASK FOR THE RESULTS OF PO1 MANOSA AND MABALA'S INVESTIGATION OF THE REPORT. GOD BLESS YOU ALL. PAWS helped Ms. Marian Yutuc of Montalban when she filed a case before the Prosecutor's Office against Christopher Babe and Gilbert Babe. The two men beat her leashed dog (a gentle aspin named "Kevin") to death before her very eyes, even as she pleaded for them to stop. According to her testimony and... affidavit, the intoxicated Babe brothers have been asking her to give Kevin to them as 'pulutan'. Now the case is Criminal Case No.0912-273 in the Municipal Trial Court of Rodriguez, Rizal - People of the Philippines versus Christopher and Gilbert Babe for violation of RA 8485 or The Animal Welfare Act. With the help of PAWS volunteers, a dozen more criminal cases like Kevin's have been filed in Court. While the low fines have not been a deterrent for RA8485 violations, the animal offenders - rich or poor - are afraid of the criminal record. Violation of the ANIMAL WELFARE ACT is a criminal act. Has your animal been wronged? Are you a witness to animal cruelty? If you file an affidavit checked by our dedicated and competent volunteer lawyers, you will have your day in Court. Download a sample affidavit (which can be written in English or Filipino) here. Charges were filed against the people who did these to the animals because witnesses (people with personal knowledge of the cruel acts) stepped forward and submitted affidavits. Help us prevent animal cruelty by being PROACTIVE through education, advocacy and concrete efforts. PAWS believes that the creation of a more peaceful society starts with the widening of mankind's circle of compassion which includes animals, thereby envisions a nation that respects animals, practices responsible pet ownership and protects wildlife. Concerned citizens can do something from their own level. Consider this: when you report a situation to an animal welfare org, are you helping them by providing complete info and a witness affidavit or are you just relying on the AW org to do all the work despite their limited resources? * ask to stay anonymous or give codenames when they report.